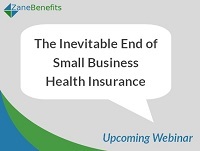 Zane Benefits, the #1 Online Health Benefits Solution, announced today an upcoming webinar on the changing small business health insurance market. During the webinar, Zane Benefits President Rick Lindquist will discuss why it's estimated that 60% of small businesses will eliminate employer-sponsored health insurance in favor of individual health insurance and Defined Contribution by 2017. The small business health insurance market is undergoing a dramatic transformation. Are you ready for this change? Health insurance professionals, CPA's, and employers should attend this webinar for a data-based discussion on the history and future of small business health insurance. Click here to register. Zane Benefits, Inc., a software company, helps employers, insurance brokers, and accountants take advantage of new defined contribution health benefits via its proprietary SaaS defined contribution software ("ZaneHealth"). Zane Benefits does not sell insurance. Using Zane’s platform, employers, insurance professionals, and accountants offer defined contribution solutions. Learn more at www.zanebenefits.com.